All praise and thanks are due to Allah. There were three brothers from Bani Israel who were called upon to go on Jihad. These three brothers had a sister who did not have any one else to be taken care other that by them. They did not know under whose care could they leave the young woman. Then they thought that the most reasonable place to leave her was with the Abid (worshipper) because he was the most trusted man in town. Barsisa, the Abid was a man who used to be in a monastery devoted to worship of ALLAH SWT. Barsisa replied “Audhu billah, get away from me.” This was an Abid who was not married and he did not want to deal with these problems. So Barsisa told the brothers, “Leave her in the empty house.” (which was separate from the monastery where he was staying). The brothers then left her there and went on Jihad. After that, Barsisa the Abid used to leave food at his doorstep and the young woman had to come out of her house and walk all the way to take the food from his doorstep. Barsisa never used to leave from his monastery. Barsisa had never met her and they were not seeing each other. Days passed by like this. One day, Shaytan (satan) came to Barsisa ki and said, “Somebody might see her when she is walking out. So rather than have her leave from her house. You need to carry it and leave at her doorstep.” So he started leaving the food at her doorstep. This happened for many days. Again one day, Shaytan came to Barsisa and said, “You can’t just leave the food at her doorstep. Somebody might see her when she opens the door and she is very beautiful. You would have to take the food and leave it inside her room.” So Barsisa would go and knock on the door. She would open and he would walk inside and leave the food there. That continued for a while. Then again one day Shaytan said, “You can’t leave this poor woman alone without giving her any company. Nobody is speaking to her. So she may be feeling very lonely and that might lead to haram. So why don’t you go and talk to her from behind the door.” Barsisa liked the idea and so for a while he would sit outside and just talk to her for HOURS. Slowly and slowly the relationship was building up and Shaytan was finding it easier to drag him to the next step. Shaytan then came and said, “You can’t just sit there talking to her, people might see you. You need to go inside, just sit in another room without looking at her and talk to her.” So for sometime that is what he did. Slowly she started getting closer to him and every time they got more and more close to the extent that eventually he comitted zina (fornication) with her. So the Abid, the worshiper who devoted his life to service in the monastery committed zina. Because of that, she became pregnant and delivered a boy. Then Shaytan came to Barsisa and said, ”Now when the brothers come back and find out that their sister has a child you are going to be in big trouble. The only way for you to put an end to this issue is to kill the baby.” Barsisa followed the advice of Shaytan and killed the child. But it didn’t end there. Shaytan came to him and said, “Do you think that this woman will keep the secret after you kill her own child? The only way out is to kill her.” So Barsisa killed her and burried both mother and child in a certain location inside the house. Later the brothers came back and inquired about their sister. Barsisa gave some reason and said, “She had passed away and this is where she is burried.” Saying that he pointed to a false grave. Then Shaytan went to the brothers and made them see a dream. In that dream they were told that Barsisa killed their sister and the proof was that she was buried in a different location (i.e. under the rock inside the house). When the brothers woke up they started talking to each other and found out that they all had seen the same dream. They thought that there must be some truth in it. So they went and uncovered the grave which Barsisa had pointed to and found it empty. Then they went inside the house and found the rock as mentioned in the dream. On digging underneath the rock they found their sister’s dead body along with that of the child. So they went to Barsisa and forced him to disclose the secret of what happened. He went ahead and told them the whole story. The three brothers took Barsisa to the king’s court and he was given punishment of execution. Barsisa did sujood (bow) to Shaytan (i.e. committed shirk) and as soon as he did so, Shaytan ran away and Barsisa was executed. 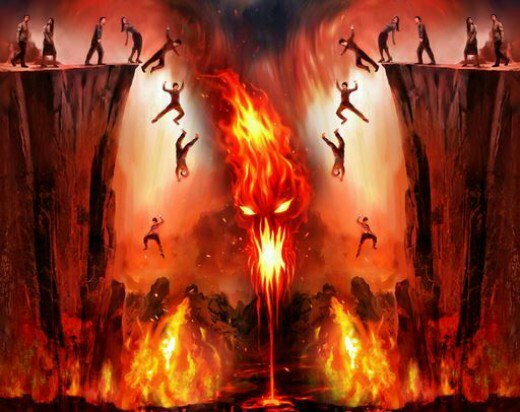 Illustration of the Hellfire and people fall into it because they worship others than Allah SWT alone. The same story was narrated by the Leader of the Believers, ‘Ali Ibn Abu Talib (May Allah be pleased with him) in another wording. Ibn Jarir said: I was told by Khallad Ibn Aslam, on the authority of An-Nadr Ibn Shamil after Shu’bah, after Abu Ishaq, after ‘Abdullah Ibn Nahik saying: I heard ‘Ali as saying: A monk worshipped Allah Alone for sixty years. Satan exerted himself to seduce him, but could not. He went to a woman and touched her with evil (maddened her). The woman had brothers whom were visited by Satan who told them to take her to that monk to receive treatment and cure. They took her to the monk and he treated her. Afterwards, she stayed for a while at his cell (house). One day, he was attracted to her and he committed adultery with her. She got pregnant and he killed her (to conceal his first crime). Her brothers came (after knowing the matter) and Satan appeared again for the monk and said: I am your friend, I did not find a solution or way to mislead you, but (finally) I set you up. So, obey me and I will save you from this. Prostrate yourself before me and you will be saved. The monk did so. Then, Satan said: “I am free of you, I fear Allah, the Lord of the Alamin (mankind, jinn and all that exists)!”. (Al- Hashr:16). This true story can be related to the above Quranic verse. Such is the deception of Shaytaan. Praise be to Allah, who Gives the Muslimeen safe haven from fitaan (trial), with the different alternatives we have been given. And when Allah ta’ala has granted us the ability to leave off this fitnah, let us not willingly plunge ourselves into potentially harmful situations. For, ultimately we put our own emaan to the test. And shall we have yaqeen [certainty] with our level of emaan, knowing that it fluctuates, increasing at times and decreasing at others? No, for Allah Knows Best that which shall come to pass. The example is brought before us, of a pious man, who fell into sin and was deceived by Shaytaan. And indeed the ma’asiyah [sin] shall touch those who are pious if they lower their shield of taqwa. So inshaaAllah, when the fitaan is present, let us remember Allah ta’ala, fear Him with the fear that He is deserving of us and distance ourselves from it. Never stop devoting yourself to Allah SWT. Seeks His bless and mercy. Ask Him for protection from satans, and trial of this life and death. This article is chirped from here and here. Posted on August 16, 2017 November 30, 2017 by omrizkiblogPosted in Inspirational Stories, KnowledgeTagged Imam al ghazzali, inspirational short story, Islamic inspirational story, omrizkiblog, short motivational story.